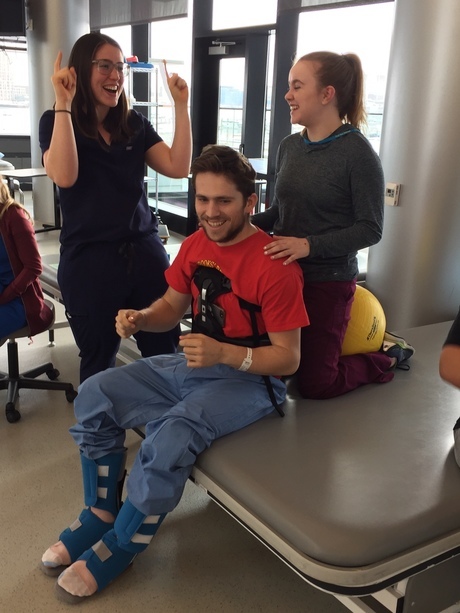 Our son Sam, BHS '13, broke his back in a skiing accident in Utah on Feb 23. 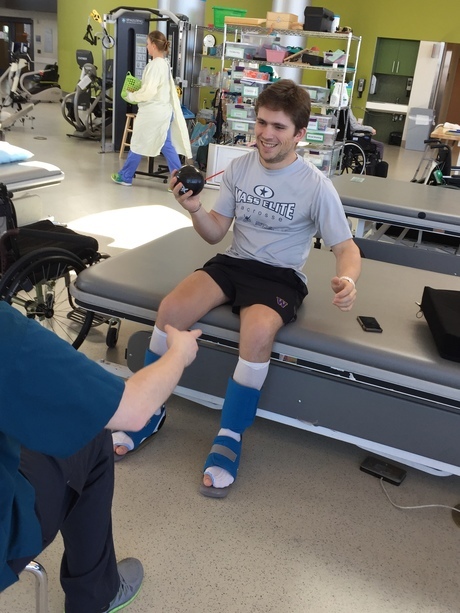 He is now in treatment at Spaulding Rehab. He’ll never walk again, but boy, will he roll! Over the next several months, we'll renovate an apartment in our house to make it accessible. We're looking for temporary housing options, maybe a short stay at Homewood Suites or an accessible apartment. Thank you, dear friends, for your love & support for Sam. For 30 years, Brookline has been home. Now we know what that REALLY means! Dear Friends, less frequent updates doesn't mean less is happening! We’ve been even busier since Sam's return to Brookline than the Spaulding pros warned. 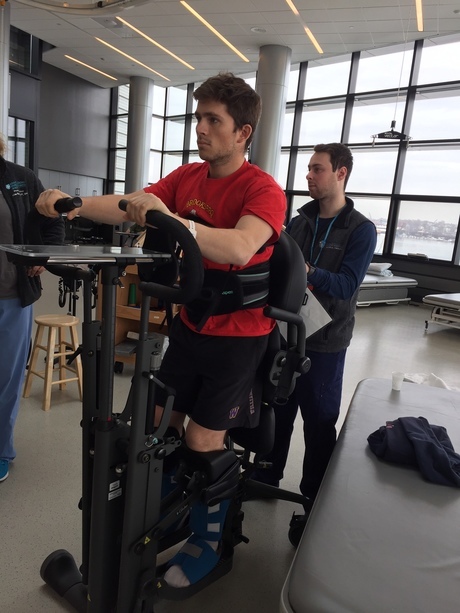 Organizing personal care routines...getting to outpatient appointments...taking delivery of equipment such as the new standing frame you see here...and seizing the day! Since taking up residence on Walnut St, Sam has: --Watched the Marathon in Coolidge Corner with his girlfriend Emma and wheeled all the way home. --Wheeled to/from Schick Park to hunt Easter Eggs. --Dined at Barcelona Wine Bar in Washington Square, twice. --Tried 3 hand cycles at an expo at UNH Durham. --Wheeled with a new fellow para friend down Walnut Path (steep!) and across Route 9 to have dinner at Pomodoro. --Hosted a friend's birthday party. --Heard a concert at Paradise Rock Club. --Taken his first on-road driving lesson with hand controls. --Lunched at Rifrullo. All this despite handling some new physical challenges as he continues to heal. GO, SAM! Oh Sam! You have worked so hard and you're now (almost) home! This makes me so happy to see and it's great to see Ben there with you. Hope you two have a blast in your new temporary digs. I'm sure many stories will be forthcoming. Can't believe it's been six weeks. Feels like an eternity in some ways, then I see how far you have come and you've done it all so quickly. Much love from Lynn and Bob. Such great news! Sam, the biking looks like fun and so liberating. Can't believe you're moving home so quickly! You've done amazing work at Spaulding and boy are they going to miss you! Today’s action photo illustrates that Sam’s longtime skill at catching and throwing balls is actually therapeutic. When you have control of your arms and chest, but not your abdomen and points south, you have to learn how to stack your weight from your shoulders to your hips. Catching and throwing a ball teaches you to deploy your remaining muscle control and range in a way that doesn’t exceed your ability to remain balanced. This has all kinds of practical applications, like reaching for objects without tipping over or dropping them. 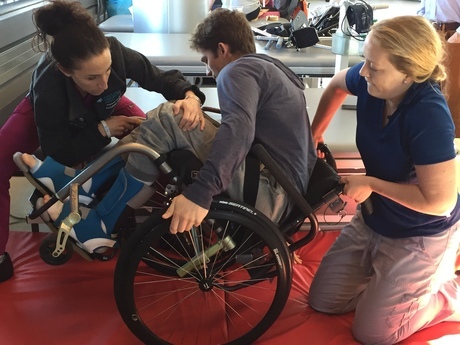 Sam is learning a new body awareness and skill that builds on his lifelong athleticism! 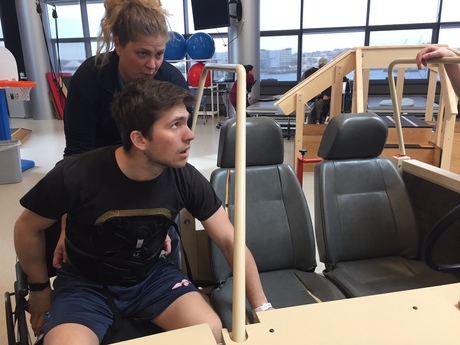 Now this was an eye-opener: manual wheelchair users get trained on how to get back upright in their chairs, and off the ground back into their chairs, if they fall! It makes sense when you think of all the uneven terrain they encounter. Imagine hitting a pothole or big crack in the pavement with a small front caster on your wheelchair, instead of a big soft car tire! So today's action photo shows Sam beginning to learn how to haul himself forward from a flat-on-his-back position. Afterward he was so tired he almost fell asleep over dinner. An update: Another Friday, another milestone: the abdominal brace (aka The Carapace) came off! Now Sam can bend more as he reaches for important places like his feet. With freedom comes responsibility: more work on torso control for dressing, bathing, etc. 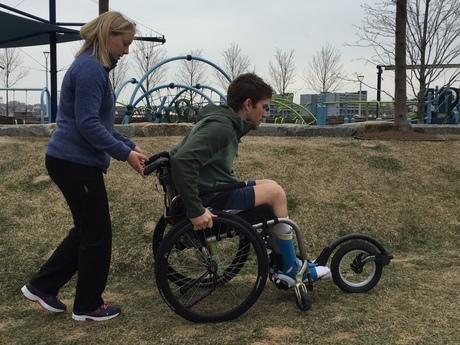 Speaking of freedom, today’s action photo shows Sam trying a Free Wheel, which essentially converts a four wheel flat-earth wheelchair into a three wheel ATV. Trusty physical therapist Trina is spotting Sam as he tackles the slopes of the scenic waterfront park right outside Spaulding Charlestown’s front door. Very hard work there, Sam! You must be getting strong. 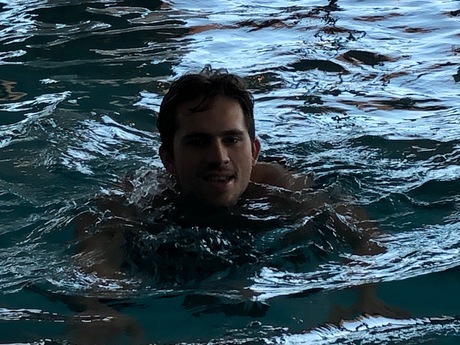 A message from Abby, Steve + Sam: Today’s action photo shows Sam taking his first swim in Spaulding’s pool! The relative freedom of movement is a tonic. But my main topic today is how wonderful Sam’s employer, construction management firm John Moriarty & Associates, has been to us all since that dark day when we had to tell them Sam wouldn’t be coming to work on Monday. 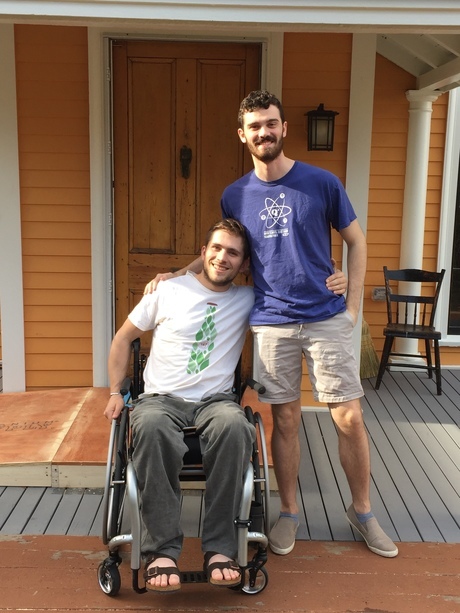 Never in our wildest dreams could we have imagined how kind, generous, solicitous, open minded, and welcoming a company could be to a junior staffer facing a new disability. For us parents it’s been like discovering a long lost branch of the family that enfolds you at first sight. Dozens of visitors, cards, and amazing gifts have flowed to Sam from all parts of JMA and from the subs Sam worked with. Sam is looking forward to getting back to work at JMA in a new role! This is just the most heart-warming news. It's a testament to Sam, such a great kid who everyone wants to have around. I bet a Monday morning going back to work will take on new meaning. Go Sam! They say it takes a village, Abby. So happy to hear about Sam's employer positive response. What an inspiring and heart-warming message from Abby, Steve and Sam! An update from Abby, Steve + Sam: Last Friday, Sam had a long, thoughtful conversation with Travis Roy, who is welcomed as a celebrity at Spaulding (but doesn’t act like one) about the physical, logistical, and emotional challenges (and rewards) that accompany the transition from free-range athleticism to WC living. Travis’s worthy foundation benefits those with truly acute, basic needs, and research toward cures. 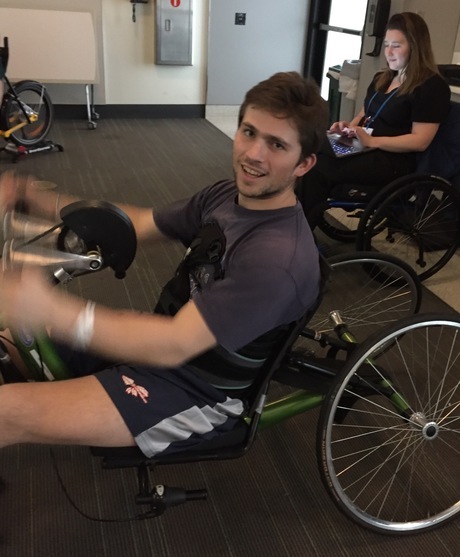 Sam has his eye on competing in races to advance Travis’s mission— see the Team Travis page for all the ways we bipeds can compete too: https://www.travisroyfoundation.org/events/teamtrf/ And check out the new action photo of Sam working up a sweat in spin class! So good to see your photos! So great to hear! Sam, you look great - I've been waiting for photos, love to see the smile! Great photo! Keep 'em coming! Love to see Sam at work, making progress. An update from Abby + Steve: "Travis Roy is paying a visit to Sam and others this afternoon! 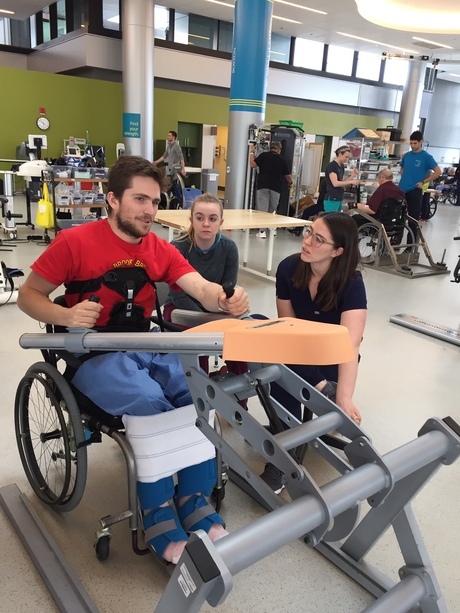 Sam’s Occupational Therapy sessions usually focus on practicing new ways to accomplish things we’ve all taken for granted since we were small, but which are very difficult when the lower two thirds of your body is unfeeling dead weight... showering, dressing, getting into a car, etc. But sometimes OT class reviews something that’s still easy for Sam, like cooking! 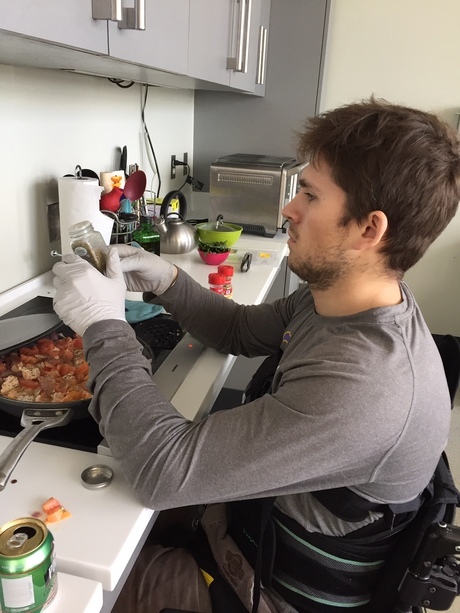 Our latest photo shows Sam sautéing at a pull-under cooktop like we’re going to install when we remodel his apartment." You’re probably a better cook than I am. You’re looking great, Sam! Travis Roy is one of my heroes! Sam is a hard working guy! It will certainly pay off. 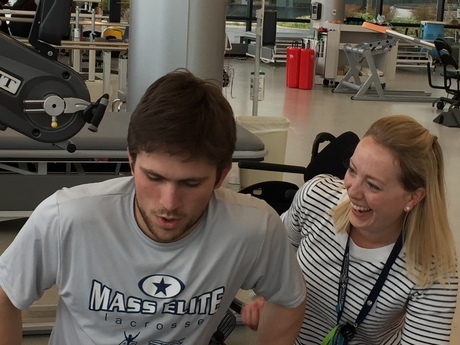 A message from Abby & Steve - Yesterday, Spaulding’s physical therapy staff introduced Sam to Functional Electrical Stimulation (FES), which zaps the muscles to make them work, even though the brain can’t tell them to. 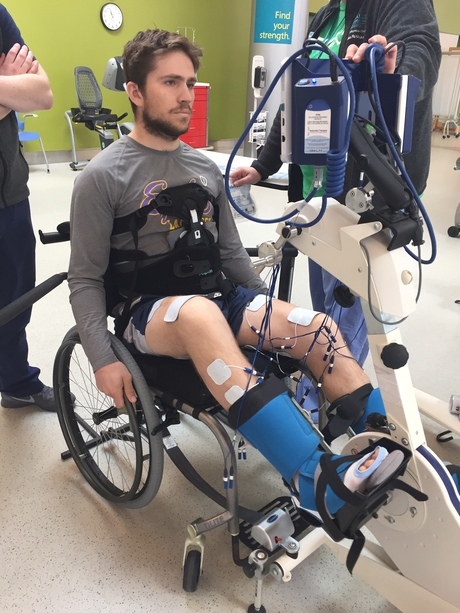 So, Sam’s legs cycled “on their own” for 45 min, maintaining muscle, bone and cardiovascular fitness. 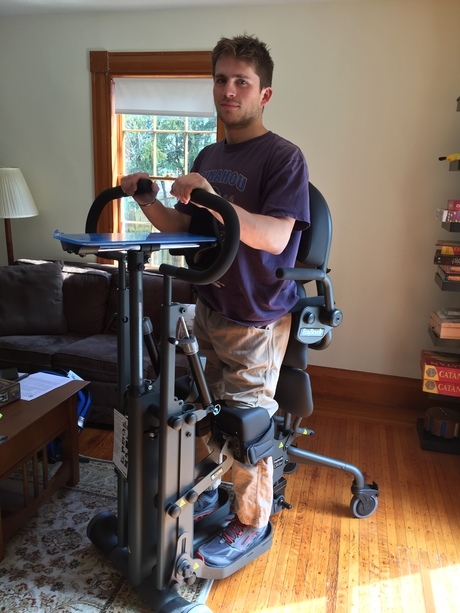 Your generosity will allow Sam to afford an FES unit for use at home to help optimize his health post-discharge! This is so great, Sam! We recently bought a version of one of those for lengthy plane flights and general muscle soreness. I was wondering about how it would work for you! It's pretty amazing to watch it working your muscles, isn't it?! from Abby & Steve - Wonderstruck is the best word I can think of to describe how we feel about the outpouring of support you’ve demonstrated here. 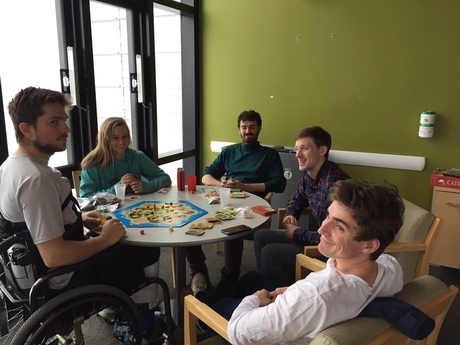 Sundays can be lonely in a hospital, but thanks to Sam’s good old pals, it flew by with board games and festive foods. We’re feeling the love! Nice! Looks like Settlers of Catan? S nice you've got great friends there. Make sure you crush them in Bananagrams! So wonderful to see that smile! Kathleen Woodward3 hours ago Go Sam! Karen Jacobsen3 days ago Thinking of you all, Sam, Abby and Steve, and sending love and strength. Mark Pener3 days ago Best wishes. 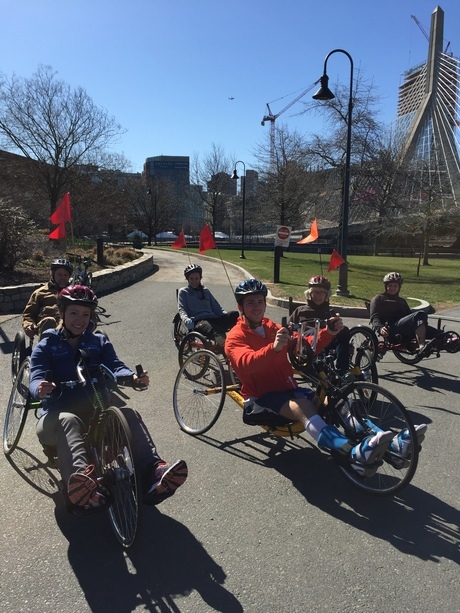 Melissa London1 week ago Sam - so great to see that picture of you out and about on your recumbent bike. Monday's marathon got me to thinking how cool it would be to watch you tackle 26.2 miles someday! Frances Shedd-Fisher1 week ago Nice to see a picture of Ben, too! I heard Sam had moved into the rental on Walnut on Friday. Big step. Frankly, I can't believe how fast Sam is moving to independence. I know he is working hard, but the staff at Spaulding truly are miracle workers. Welcome to your new home, Sam!